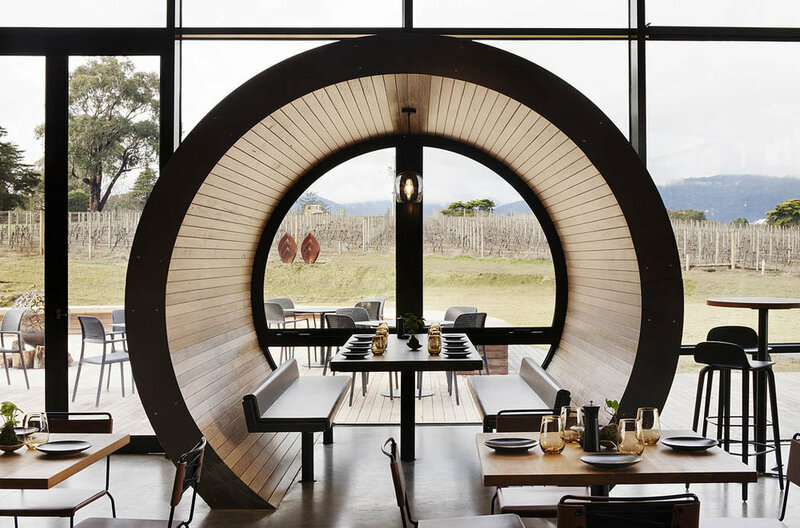 Levantine Hill is a unique Yarra Valley estate set upon elevated acreage with vineyard views leading down to the Yarra River. Iconic chef Teage Ezard and winemaker Paul Bridgeman are behind Ezard's Restaurant and cellar door where Levantine Hill wines are matched with European inspired food dishes. Lights & Tracks were engaged to design, consult and supply the lighting on this stunning project alongside Molecule architects, Fender Katsalidis and Krongold Constructions. Lights & Tracks worked closely with Molecule Architects to develop a flexible track lighting system that allows for discrete and uniform luminaries to up light the rolling 100 meter long vaulted ceiling creating warmth in the bar and restaurant that did not take away from the surrounding hills and valley views. Warm white adjustable spot lights were strategically placed to direct and create intimate and comfortable ambience amongst the diners. The architectural timber cladded dining booths emanate the shape and feel of a wine barrel whilst framing the surrounds and feature hand blown glass pendants especially sourced by Lights & Tracks.